The word Kavach means armour. 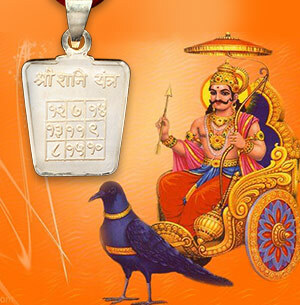 The Shani Kavach is a very powerful talisman that offers protection, success, good health and wealth. The Shani Kavach is a sacred object of veneration that comprises of numbers and symmetric design that resonates with the powers and positive frequencies of Lord Shani. This divine diagram holds the divine powers to attract the principles of Lord Shani and carries the signification of Shani mantra or the process. 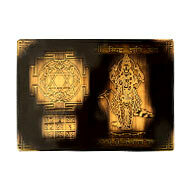 The mystic Shani Kavach Yantra bestows mental and physical strength, promotes courage and boosts confidence. Lord Shani is one of the prime deities in Hinduism. He is highly revered as the God of Justice and Truth. A majority of the people have misconception about Lord Shani being cruel but the fact is that Lord Shani Dev is the Lord of Justice and Truth. He gives you the fruits of our karmas (deeds). People have Shani Dosha can wear this kavach in order to get relief during the period of Sade Sati or to keep away all evil. Apart from the above reasons any devotee of Lord Shani can adorn this Kavach and receive blessings from the Lord Himself. The powers of a Kavach thrive on the resonance of the cosmic energies. When an energised Kavach comes in contact with the skin and when we pray over it, it gets activated and offers optimum results. The vibrations of the kavach create an aura of positive energy around you. Kavach is the medium through which we can establish a strong connection with the higher energies. The celestial vibrations generated by this kavach help us attain spiritual course of conduct in our daily lives and enhance the spirituality within. 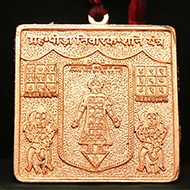 When you look at the Shani Kavach, you will notice certain numbers embossed, engraved or printed on it. These numbers make a mathematical design and if you look closely, whichever way you add the given numbers, be it horizontally, vertically or diagonally, the sum of it remains constant. The upper centre of this diagram contains the number for each respective planet. You can now buy the Shani Kavach online at the best price. We at Rudra Centre, offer various types of Shani Kavach which are made of various metals and are crafted with finesse. The stringing methodology of this Kavach is also done as mentioned in the ancient texts. You can choose from the variety of designs. The price of the Shani kavach varies as per the designs, weight and make of the Kavach. All the products offer optimum benefit and are highest quality metal is used to make this kavach and thus, the prices vary.